ISUtrecht is building a cohesive music programme for all students from KG up to grade 10. It is our aim to provide an allround music curriculum for all our students with the option to join an ensemble, or take private lessons at school. We believe music is an art form in which many different skills, the learner profile attributes and creativity come together. At the ISUtrecht we are creating an environment where music is always present and where children will be educated to become skillful musicians, whilst at the same time being encouraged to use music as a creative outlet. In our main building we have a dedicated primary, as well as a secondary music room. There is also a practice studio, which is used for practicing, or recording music, but also for one-on-one instrumental lessons. 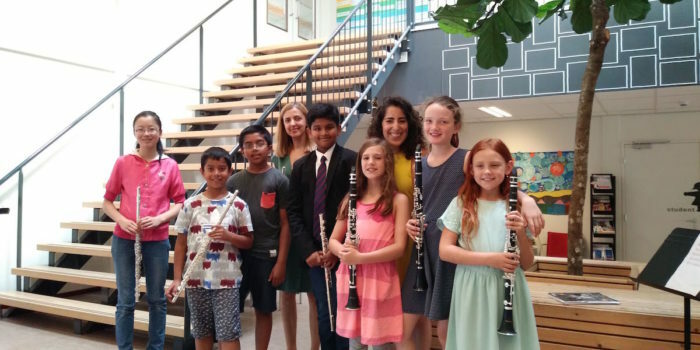 In the IB Primary Years Programme (PYP) music teachers Jennifer Diepman and Juan Osorio focus on giving the students a solid base in both understanding and making music. In addition to the regular music lessons, students from grades 4-5 participate in the yearly Young Composers’ project. 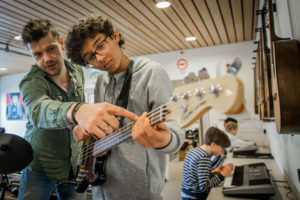 This project, developed by ISUtrecht in conjunction with music centre TivoliVredenburg, teaches the students to compose a piece of music, which they then perform at TivoliVredenburg. In kindergarten students start with the concept of steady beat. They also work on finding their ‘singing voice’. Music is taught with the Kodály philosophy in mind. Kodály, a mid- twentieth century Hungarian composer, has been a world-wide influence on the way music is being taught to young children. He developed the idea of working backwards, whereby children are first being introduced to musical concepts by listening, or singing, before they learn music notation. 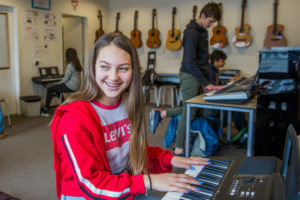 In the IB Middle Years Programme (MYP) the students get to make and experience music during a host of dynamic projects, such as songwriting and recording pop songs, learning about the music industry, experiencing the polyphonic music of J.S. Bach, or playing songs from the sixties for the elderly people in a care center close to the school. Responsible for the secondary music lessons is music teacher David de Geus. The school has a primary choir, primary orchestra, secondary a cappella vocal group and school band. The band, together with the ISU Drama Troupe creates a yearly musical production. 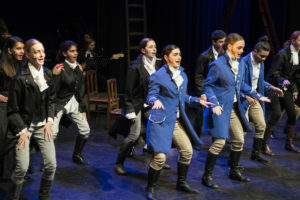 In the 2018-2019 academic year they staged the musical Hamilton. For students who are really interested in music, who want to learn to play an instrument or for those children for whom music is an essential and predominant part of their life, we currently have several music teachers providing private instrument lessons. These lessons can take place during the school day when students are available, or in the afternoon, when lessons have finished. It is currently possible to have guitar, drum, keyboards, viola/violin, flute, drums, cello, clarinet, trumpet, horn, trombone and baritone tuba lessons. Over the coming years this programme will be extended to include more instruments.